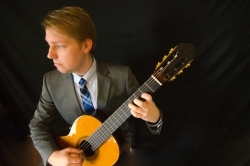 EKU Student Degree Guitar Recital: Henry Schrader, Senior Recital: March 29, 2018, 7:30PM, Gifford Theater. EKU guitarist Henry Schrader will be performing a captivating program that features classical, jazz and blues music. His concert will offer selections by Heitor Villa-lobos, Antônio Carlos Jobim, Francisco Tárrega, Duke Ellington, the Grateful Dead and Johnny Cash. Mr. Schrader is a student of Dr. Dennis Davis.